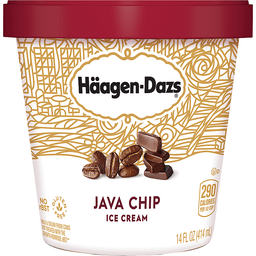 Haagen-Dazs® Java Chip Ice Cream. Gluten free. No rBST. Milk & cream from cows not treated with the growth hormone rBST†. Full-bodied coffee ice cream sprinkled with rich, sweet chocolaty chips. †No significant difference has been shown between milk from rBST treated and non-rBST treated cows. The suppliers of our other ingredients cannot guarantee that the milk they use comes from non-rBST treated cows. FSC®, mix. Questions or comments Call 1-800-767-0120 8am-8pm ET. or visit us at haagendazs.com. Trademarks reproduced under license. ©HDIP, Inc.